posted by flipstudios at 9:54 p.m.
Great blog and wonderful work. I added you to my links, hope you don't mind. Keep doing the pencil scribbling instead of wacom stuff, please. They look great! I love your animal drawings! 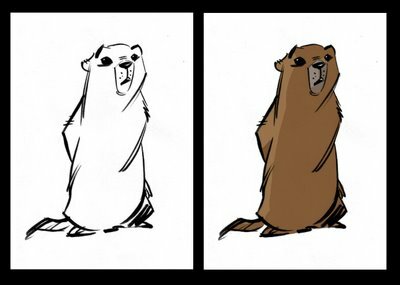 Everything you draw is great, but animals are the coolest. And a marmot?! Can't go wrong there! Well, I could... but you can't. If I had any special Photoshop knowledge, I'd share it, but alas... I'm just guessing my way through stuff too. The world needs more scribbling penciler. Your linework contains a massive amount of appeal, you don't need anything more than to leave it as it is or drop some color over it with a marker. People who say clean-up is easy are likely doing it wrong! Clean up takes time to look natural. Certain styles call for it. ...but that's why my "clean-up" is ruff. loose the life you've got kickin' now. "i wish i could just do pencils but that's not always what the client wants. somehow i need to find a way to keep the looseness of my sketches without killing the pose." I'm totally in the same boat, Andrew. If I had my way I'd just continue to work with pencil on paper, but things being what they are it seems like us scribblers need to learn how to work "paperless" to stay viable. You can get trial versions to try before you buy . Also a less expensive program that is similar to Sketchbook Pro is ArtRage 2. It has a free version that will let you get a feel for it to help you decide if you like it. 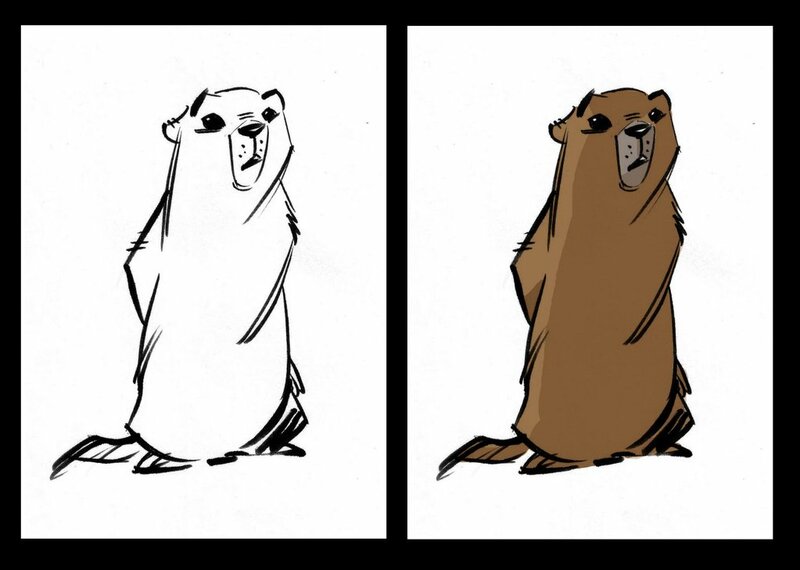 Nice drawing of the marmot, by the way. Love the other stuff on your blog , too. I've just added you to my links. good stuff man, i've just started dabbling in color myself, tis hard stuff indeed. I reeally like this latest piece , great shape and superb lines. Nice design. Fluid and simple lines, great shape, AMAZING character. Excellent work!! The wolverine design is stunning!! clean up scares me to no end: Never been very good at it. This is an appealling cleanup, at least. Marmets are certanly an underused mammal and a nice choice. Love what your doing Andrew! Your pencil work is amazing, but don't corner yourself. Experiment with all sorts of mediums, and software. I've only recently started coloring everything in Photoshop, and love the "Command" + "Z" option. Just have fun with it. Play around with different styles, approaches. 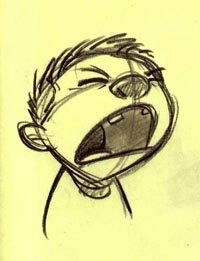 There's no better way to get frustrated in your work than to force it too hard. Relax and enjoy what you do. You're work is already so strong. Nice pose and facial expression. I like how he's more or less standing straight, but still has lots of action! AW, he looks great Andrew. I'm sure you'll have no problem with color. Thanks for the comment! Ha, a dancing job. I'm sure he dances in his little office but I've never been lucky enough to catch him in the act. Arh... Hope you had a great Thanksgiving! Amazing work, man. I made another really long post two minutes ago, but just to show how stupid with computers I am, the post got erased, please don't ask how. I love the way animators art looks. I have a similar problem, I don't like to clean up at all, so I like to ink my works, just over the sketches. Love your blog, the story boards, the illustrations and sketches! Very inspiring!!! Nice lines in here, keep da flow! Thanks for all your comments and encouragement. david n: your advice and links were totally helpful. It's so awesome having such a talented group of artists to learn from. Cheers and have a great weekend. I love your cartoonist style!!! wonderful blog and very cute sketch ! i like this and i will come back ! see you! sorry for my bad english !!! Great blog, your work is truly inspirational.